On Saturday, I'll Have Another will take to theBelmont Stakes for a run at horse racing history. 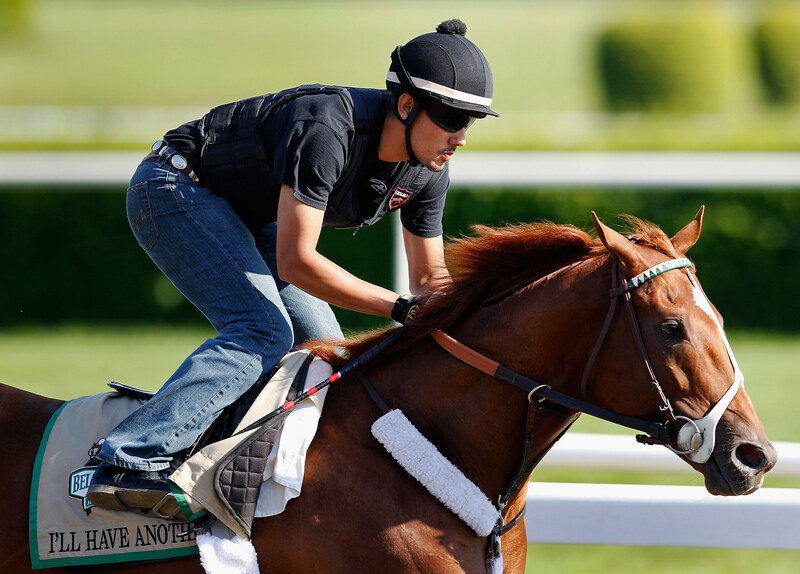 He'll face eleven other horses in his quest for the Triple Crown. Below, we give a brief description of each horse, and list what - from a betting stand point - you can do with each. 1 - Street Life - 12/1: He's certainly not the class of this field, but may be the best of the second flight of horses. Showing a poor finish in his only grade 1 stakes, you shouldn't expect much from this colt, but as a closer in a flukey race like the Belmont, you may see him in the end. Betting Possibilities: Unless his odds fall, I don't love him as a win bet, but he's worth a play in exotics. 2 - Unstoppable U - 30/1: Having only raced twice in his career, it's hard to handicap Unstoppable U. I expect him, however, to set the early pace, having won both races from the front. He's never run beyond a mile in his short career, though, so don't expect him to be there at a mile and half. Betting Possibilities: Not much, perhaps in exotics but only if his odds fall. 3 - Union Rags - 6/1: Trainer Michael Matz has called in a sub, and it's racing's best jockey. John Velazquez will be aboard Saturday as Union Rags looks to redeem himself. A colt who makes his move on the turns, the Belmont track could suit him, and he's absolutely a favorite to win this race. Betting Possibilities: Win, place, show and a must have in all exotics. 4 - Atigun - 30/1: There's not much to like here, with an 11 length loss and an 11th place loss in his only graded stakes races, don't look for much. Betting Possibilities: None. 5 - Dullahan - 5/1: If Union Rags has upgraded to the number one jockey in racing, then Dullahan has upgraded to number 1A. Look for Javier Castellano to have the late running 3-year-old poised to win on Saturday. He'll sit closer to the front than this late running colt is used to, but will still rely on a strong finish and every bit of that mile and a half to try and overcome the favorites at the wire. Betting Possibilities: Attach his name to anything that moves. 6 - Ravelo's Boy - 50/1: 50/1 seems about right. Not even in a flukey race like the Belmont do I see much here. Betting Possibilities: Ew. 7 - Five Sixteen - 50/1: If there's a long-shot-type to watch in this race, it may be Five Sixteen. He's finished first, second, third and fourth in his last four races, but still, he's 50/1. Betting Possibilities: Couldn't blame you for taking a flyer on him at long, long odds. But that's it. 8 - Guyana Star Dweej - 50/1: It took this horse 8 attempts at Aqueduct to brake his maiden. He's been around the front, so I guess that's a good thing, but 8 attempts? Next please. Betting Possibilities: At 60-1? Maybe put $2 on him to show. Maybe. 9 - Paynter - 8/1: He'll be the second speed horse in this race, likely sitting just off the flank of Unstoppable U. Unlike the 2, however, Paynter has shown that he can post some serious speed figures in graded stakes - albeit a grade 3. You don't love frontrunners in the Belmont, but if there's one to like, he'd be it. Betting Possibilities: Worth a play in exotics. 10 - Optimizer - 20/1: I didn't like him before the Derby, and in two Triple Crown races, he hasn't given me much reason to like him. Betting Possibilities: At 20/1? None. 11 - I'll Have Another - 4/5: To put it simply, he's a just favorite. His sit close to the lead and come from behind style will suit the Belmont well, the only question is whether he can run down Union Rags at his best and survive the late charging Dullahan. He could absolutely pull it off, but with the 3 in front of him, and the 5 likely trying to run him down, Mario Gutierrez will have to pick the perfect time to send him. If he errors in either direction, Triple Crown hopes will be cast asunder. Betting Possibilities: Can't love any win bet at those odds, but he must, MUST, be in your exotics. 12 - My Adonis - 20/1: This colt has been hit or miss throughout his racing career, and his inconsistency doesn't exactly instill confidence. Chances are he'll be a front runner, and I'm not sure you win this race with that style. Even if that style can win, he's not the best of that crowd, so I can't endorse him. Betting Possibilities: I'd avoid. Be sure to check out a more in-depth preview of the race itself which will hit the site later this afternoon. And click the button below for a listen at the 2 Guys 1 Mic Podcast's full fifteen minute Belmont Stakes preview.